Off the beaten track and set in a peaceful valley with views of the Puketoi Ranges and hill country farmland. Otapawa gives visitors a taste of the country lifestyle. 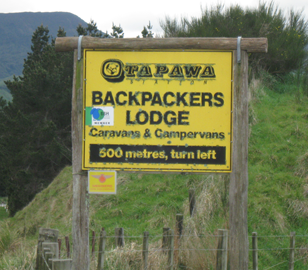 With both farmstay (optional B and B) and backpacker accommodation available - Otapawa Farmstay and Backpackers is suitable for families, group bookings or backpackers wanting a rural experience. Otapawa is also able to cater for groups who would like to gather together for a special occasion. Located at Tiraumea on a hill country sheep and beef station. One-hour drive from Masterton. An ideal halfway stop between Wellington and Hawkes Bay just off Route 52. Campervans and Caravans are also welcome. Children will love the farm animals which include, pigs, donkeys, dogs, lambs and calves. Feed the hens and see the peacock. Outdoor activities include farm walks, garden walks around the hosts gardens, 4x4 Club farm tours , take a picnic beside the waterfall or view the seasonal on farm acitivities such as shearing, docking or mustering. Play table tennis at the woolshed or make use of an empty paddock for minor games and sports. . Bonfires are possible for groups ( enquire at time of booking). Meals available by prior arrangement. BBQ available for self catering.